Kevin Fox is an Evesham resident who oftentimes walks to the Village at the Greenes shopping center on Evesboro-Medford Road to enjoy a cup of coffee. Fox is also blind and visually impaired, and must navigate two lanes of traffic on foot across North Elmwood Road and Evesboro-Medford Road to get to that coffee, or eat a bagel, do his banking, pick up his dry cleaning or whatever else he might be trying to accomplish on a given day. The reason Fox has to routinely risk his life is because there’s no sidewalk on the east side of North Elmwood Road at Inglis Gardens, the independent housing complex for those with physical disabilities where Fox and others like him reside. 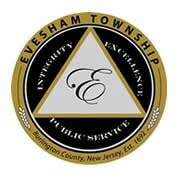 It was that lack of safe travel that brought Fox and his fellow Inglis neighbors to the April 14 meeting of the Evesham Township Council, pleading with township officials to rectify the situation. “God forbid crossing that street one day I’m just so afraid that somebody crazy is going run me down,” Fox said, as he explained the situation to council and the audience. Jon Allen, a nine-year resident of Inglis Gardens bound to a wheelchair, spoke of a similar fear, and said he found it “completely ridiculous” that every time he wanted leave his apartment and venture down the street to shop in the complex that he was risking his life. Josephine D’Antonio, a childhood Polio survivor who said she was able to walk “by the grace of God,” told council she had voiced similar safety concerns at multiple council meetings in the time since the Inglis Complex was first constructed more than 10 years ago. Yet once again, she said she felt her and her neighbors’ pleas might fall on deaf ears. “If one of my beloved neighbors is in a critical accident, don’t bother offering your condolences,” D’Antonio said. Sheryl Wolkoff, a resident who lives nearby the Village at the Greenes shopping center, said she also recalled numerous instances of seeing people in wheelchairs having a difficult time trying to navigate the road. Once residents had finished speaking about their plight, township manager Tom Czerniecki said fixing the problem wasn’t as simple as building a sidewalk along the east side of North Elmwood, as some of those who spoke proposed. According to Czerniecki, about five years ago, the township launched an effort to secure a grant and build such a sidewalk, estimated to cost $300,000, but the land where the sidewalk would be built was delineated as wetlands and noted as an Indian Burial ground by the state historical preservation, making it unworkable. “That is where the grant application died,” Czerniecki said. Mayor Randy Brown said it was that designation, not cost, which prevented the council from putting a sidewalk in for the Inglis residents. “Let’s say all five of us said ‘we want a sidewalk there, we will spend $8 million for it,’ but the state of New Jersey says you don’t get an approval to do it,” Brown said. Brown asked that a group of Inglis residents soon meet with the township manager and engineer and work toward other safe solutions the township could potentially implement.